You guys, the floors. Seriously, they about killed me. You would think that choosing something to walk on in a room that only take up 20% of your house would not be this challenging. And for most people, it probably isn’t. But I am not most people. In case you have missed any of the flooring drama, you can catch yourself up here and here. The good news is that we have finally made our decision. And I think we love it. It’s not installed yet, so I can’t say for sure, but we are pretty happy with the sample we laid out when the materials arrived. Creating a white washed pine “look” using this technique. Going with a reclaimed pine from a place like this. We finally settled on laminate. The pros are it’s easily to install, durable, and easy to maintain. The cons are a little harder to express, basically I was just worried that I wouldn’t like any of the options out there. From the beginning of this project I have envisioned some sort of wide-plank, light/white colored wood for out there and I was concerned that I wouldn’t be able to find the look I was going for in a laminate. But since the material made alot of sense for the space, I started researching. Let me start by telling you that there are three kinds of laminate out there. Well, there’s really a million kinds but what we found is that each option we came across fell into one of three categories or grades of laminate. First there’s the really cheap stuff that is basically just a step up from the best vinyl products out there in terms of looks and durability. It’s not a bad product and certainly would be an attractive option in certain spaces. But we want the floors in the sun room to be on par looks-wise with the rest of the house, so we wanted something a bit nicer. The middle grade of laminate is full of selection, and you can find a lot of good options and samples at your local Lowes or Home Depot. Brands like Pergo, Bruce, etc. make some really great laminate options that look terrific and have great durability ratings. We liked several of the options that we saw in this category, but nothing that really had the look I was going for. I wanted wide planks and most of these options are under 5″ wide. So I Googled “wide plank laminate” came across what I am calling the third category of laminate; “high-end laminate.” This stuff costs almost as much per sq. ft. as real wood, but also looks much more like real wood that the other categories. Products in this category also tend to be thicker with longer durability ratings, and many options are 5” and wider. I found myself exploring the options on Armstrong’s website. Online we really liked this option as well as this one. So we found our local, authorized Armstrong dealer, Flooring America, and stopped in for a sample. The showroom was great and we got to look at a lot of options. In addition to all different types of flooring the store also had kitchen and bath showrooms, so we were able to see how our options looked against different color cabinets, which was a nice bonus. In the end, we decided to take samples of the two products we liked online. The nice thing about these samples is that they are much bigger than the samples that are available at Home Depot and Lowes. Below are the two samples we originally liked in store. 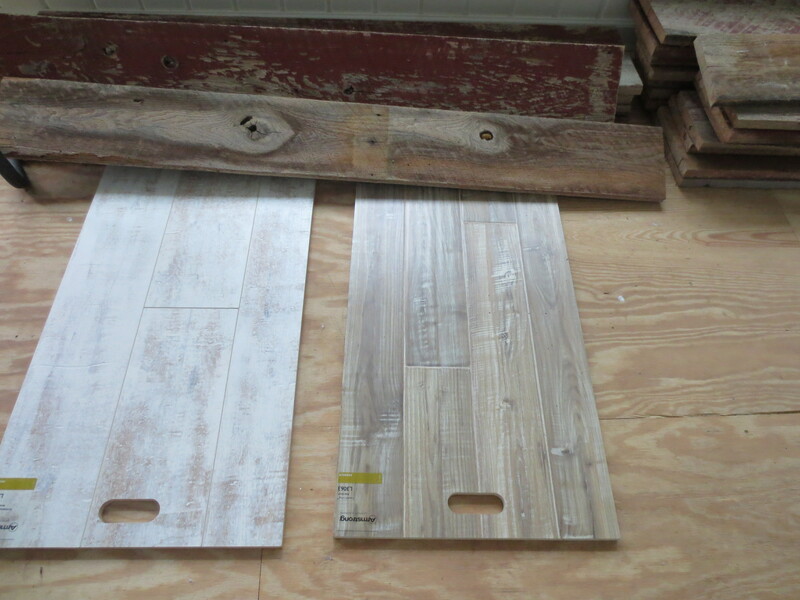 The sample on the left is Armstrong Antique Structure/Historic Element Milk Paint and on the right is Armstrong White Wash Boardwalk. When we got the Armstrong samples home and laid them out, we liked them both. But we felt that the one on the right was too similar to the barn board. It’s a little hard to tell in this picture, but the wood is a little darker and we weren’t happy, so back to the store we went. 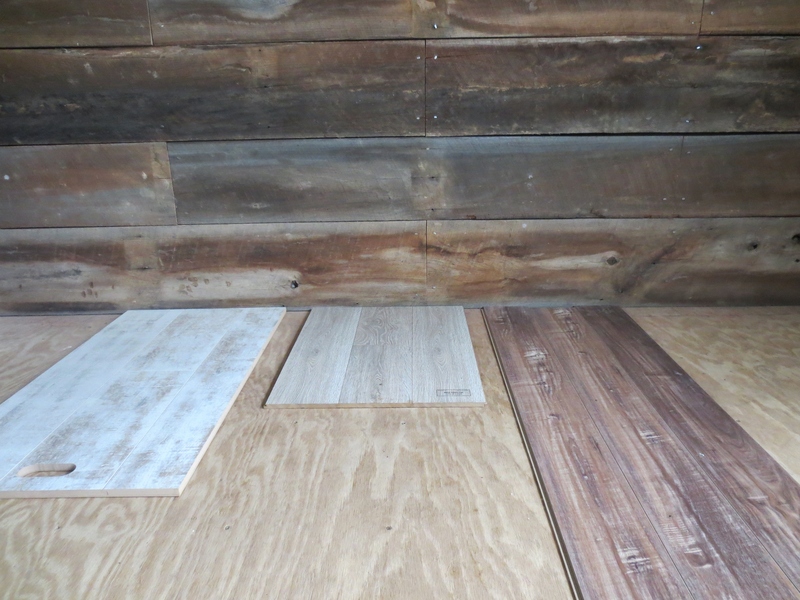 This time we brought back the whiter sample that we took before, another option we tried from Home Depot, as well as a new option called Black Forest Oak that is made by Mannington. 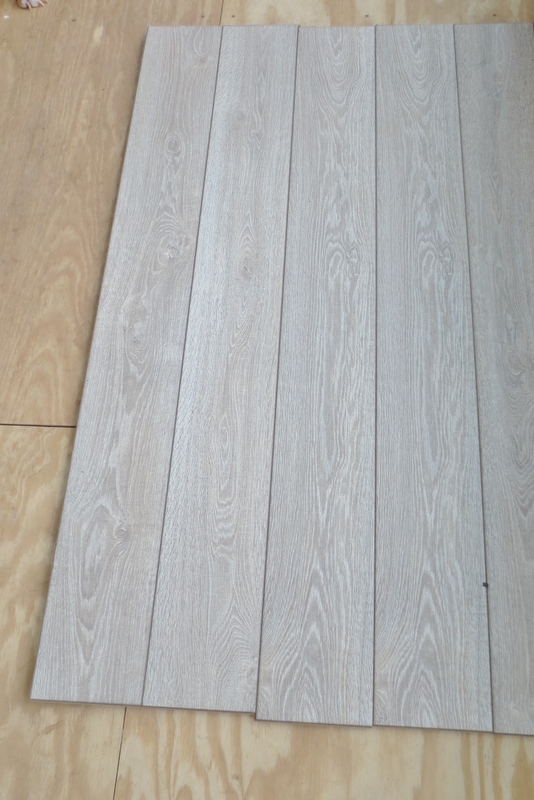 We thought the middle one (Black Forest Oak) looked the best with the barn board. We also liked that it had a lot of depth and texture with a good mix of white, grey, and tan tones. And we also think that it will hide dirt and dog hair well which is really important in this room. We had to buy about 340 sq. ft. to cover the room and account for a bit overage. The total cost was just about $1,400. Mark has been out of town so this coming weekend will be our first chance to get it down, but we have had it for a week or so and we are loving it so far. Do you guys like it? I know it is hard to tell from such a small sample but hopefully Monday will be the big reveal. I think it looks great, Kate! Good research!